thanks to Jane I found your blog... I'm looking forward to follow your work and progress from now on. Wow, that tiny scene turned out great - beautiful landscaping. This small scene is gorgeous work! No, personally I haven't ever worked in such a small scale, so I'm afraid I can't help you.....but you can always try to do so ;)! Oh Ms.Bee its a wee bit of fantastic mini makin it is! You really made this little bit o land quite beautiful and green..oh I miss the green! It's a work of art! I think it is smaller than 1/48th. If you measure the height of one of the characters and say this is 2.5cm=1inch. An average person is around 180cm=6foot. Divide 180 by 2.5= 72. Which is 1/72th scale. 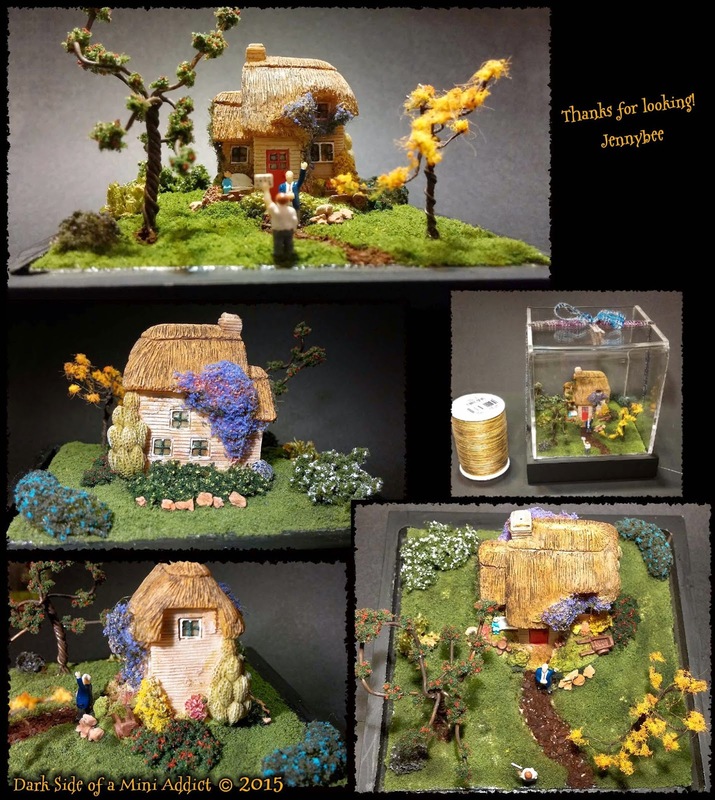 For the use of very small LEDs have a look on Karin Corbin's blog, she makes glitter houses in micro scales and uses led lights in those. I love working on small scales. It's fun but you do have do create many of the minis. I use match sticks and wooden laser cut fans, and of course punches for the landscaping. Exquisite work. The detail is so well done and just beautiful. Jennybee!!!!! This turned out so beautiful... I love it!!! I adore 1:48 scale, I am adding lights to my Pickett Pond (a first time for this scale)... I got my lights at True2Scale ... she has a simple little tutorial also.